Join Tracey Renee McKee as she guides you on a powerful Soul Journey! In the quiet sanctity of a Soul Journey, long sought answers arise easily and effortlessly as you sink deep beneath everyday life into the realm of inner truth. 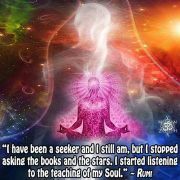 It is a holy sojourn where you can truly begin to hear the secret messages of your soul. Each meditation will end with a grounding ritual using Himalayan singing bowls that infuse sound waves directly into the body. Tracey Renee is a certified Soul Coaching® Practitioner, Vibrational Sound Therapist, Reiki Master Teacher, Past Life Regression Therapist, Consulting Hypnotist, and Founder of Mindful Soul Wellness. She is passionate about encouraging and guiding others to live a self-empowered and soul-inspired life. Visit www.mindfulsoulwellness.com to learn more about her journey!